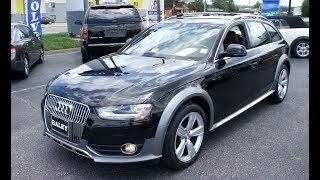 The Audi Allroad 2013 has been recently revealed and as its predecessors the new model boasts the same mix of characteristics including the practicality of a wagon, the luxury of an Audi sedan and decent off-road capabilities. As you may recall, when it hit the market back in 1999 the first Audi Allroad was solely based on the A6 Avant wagon. However, after a few years have passed the Allroad become a part of the A4 Avant family as well, so without further ado let's take a look at what the 2013model has to offer. Under its bonnet resides a 2.0 liter four-cylinder turbocharged engine that develops 211 horsepower and 258 lb-ft of torque. The unit is then paired up with an eight speed automatic transmission as a standard, with no option of choosing a manual. 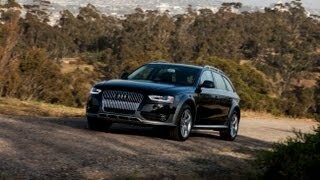 As expected, the Allroad comes with the famous Quattro all-wheel drive system as a standard, the only downside being the fact that unlike the older model the new one does not offer a height-adjustable suspension or the off-road-ready low-range gearing. 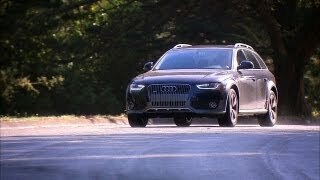 Performance-wise Audi's quasi-SUV will go from 0 to 60 mph in 6.5 seconds and as far as fuel efficiency goes, the Allroad is rated at 20 mpg city and 27 mpg highway. On the exterior the model in question manages to differentiate itself from the standardAvant with the help of a more aggressive front fascia, the redesigned front grille, aluminum roof rails and stainless steel skid plates. Its off-road capabilities are exteriorized through the matte finished wheel arches and lower bumpers. There are three trim levels available when buying the Allroad, those being: Premium,Premium Plus and Prestige. The Premium trim level offers leather upholstery as standard as well as automatic climate control, panoramic sunroof, LED turnsignals, fog lights, heated headlamp washers, a set of 18 inch alloy wheels and a ten-speaker sound system. Premium Plus adds a few more features to the previous trim level, such as heated front seats with memory functionality, iPod integration, a three-zone automatic climate control, Bluetooth connectivity, Homelink universal garage remote, LED taillights and power-folding side mirrors. Lastly, the top-of-the-line Prestige trim level adds the Audi Connect feature which brings internet connectivity and Google Earth integration, a 505-watt 14 speaker Bang & Olufsensound system featuring HD radio, Audi side assist, rearview parking camera and keyless start. Pricing for the Audi Allroad 2013 starts at $39,600 and as far as the competition goes, the carmaker's wagon still remains a rather unique specimen to a certain degree. However we could say that its main competitors include the Cadillac SRX, the BMW 3-Series Wagon or the Acura TSX Sport Wagon.